Celebrating at the finish line of the 2017 Pan-Mass Challenge. Jen Hathaway’s fitness journey has taken some sharp turns over the years, and now it’s on an upward curve with no end in sight. But it took a tragic personal loss to bring a life changing focus to her efforts. In May of 2015, Jen lost her father, Howie, to cancer, and his death capped a stormy period in her life when she lost touch with her love of athletics – even as she pursued a career catering to athletes. As she grew up in Holliston, Mass., Jen was a competitor herself in high school softball, volleyball and basketball. At Russell Sage College in Troy, she continued playing softball and volleyball. After graduating in 1993 with a degree in Athletic Training, she obtained her certification in Sports Massage, and worked several jobs before landing at the Southern Saratoga YMCA as Fitness Center Coordinator. At the Y she taught strength training, youth fitness classes, and started the sports massage program before leaving in 2001 to realize her goal of opening her own massage practice, which became Back in Balance Therapeutic Massage. Over the following years her health and fitness career flourished even as she gradually lost touch with the personal satisfaction she got out of exercise. She worked with players from the Albany Firebirds arena football team, elite athletes at Freihofer’s Run for Women, and Can-Am Rugby Tournament in Saranac Lake/Lake Placid. She also provided post-ride massage services at Tour de Cure, and in 2005 began supplying massage therapy services to sports teams at UAlbany. She also became a regular volunteer and Massage Tent co-captain at Ironman Lake Placid. But the hectic schedule, recurring knee injuries, and “life getting in the way” led to inactivity and weight gain. “I would work out here and there, but I certainly fell off the fitness wagon for some time,” she remembers. Then, in January 2014, her father was diagnosed with cancer, and her focus shifted even farther away from fitness as she traveled back and forth to Massachusetts to support her parents. “I wanted to spend as much time with my dad as I could,” she said. “I would work Monday through Friday, and as soon as I was done on Friday, Murphy and I would get in the car and head home, spend time with my dad, help my mom, then come back Sunday and first thing Monday morning to start all over again.” The hectic schedule, high stress, and lack of exercise took its toll while she made family her priority, so she lost fitness and gained weight. Gradually Jen “started coming out of the fog” and decided to do something in honor her father. Howie had been treated at Dana-Farber Cancer Institute in Boston, and while searching for info about the institute she discovered the Pan-Mass Challenge (pmc.org). The annual ride across Massachusetts attracts riders and volunteers from more than 40 states who have raised almost $600 million to support Dana-Farber since 1980. Riders can choose from different ride routes, from 25 miles in one day to 192-miles in the two day eastward route from Sturbridge to Provincetown. Many riders participate in honor of family members or friends fighting the disease, and the event is known for its vocal public support from communities along the route. “I said to myself right then and there, ‘I’m gonna do this,’” she remembers. “I told my mom. When I got back home I signed up for spinning.” Jen knew nothing about cycling and had taken exactly one spinning class before. She knew how to prepare for softball or basketball, but not this. “I had a bike, but I think the furthest I’d ever gone was 12 miles casually. I was sweating as I registered, because it’s a non-refundable deposit. I was like, ‘This just got real.’” She set her sights on the 80-mile second day ride from Bourne to Provincetown for August 2016. Then she started spinning two days a week, doing strength training workout videos and cardio, and taking long walks with Murphy. The positive results started quickly. “I was just kind of taking care of myself again, and the more I did, the better I felt. Mentally, I had a better outlook, more focused, better mental clarity. The better I felt on the outside, the better I was feeling on the inside.” The weight also started coming off, and between May of 2015 and August 2016 she shed 50 pounds. She went down four clothing sizes and had to constantly buy smaller sizes. In March 2016, Jen bought a new bike and started riding outside in April, posting the training schedule supplied by the PMC organization on her fridge and following it exactly. Her schedule became simple; outside riding and indoor spinning classes. That’s all there was time for. When August came, she arrived in Bourne at her start line and marveled at the scene. She started her own ride, and people stood cheering all along the route, and each aid station had its own party in progress. At one point, she passed a woman playing bagpipes and thought of her father, who had always loved them. Over seven hours after the start, she triumphantly crossed the finish line in Provincetown. 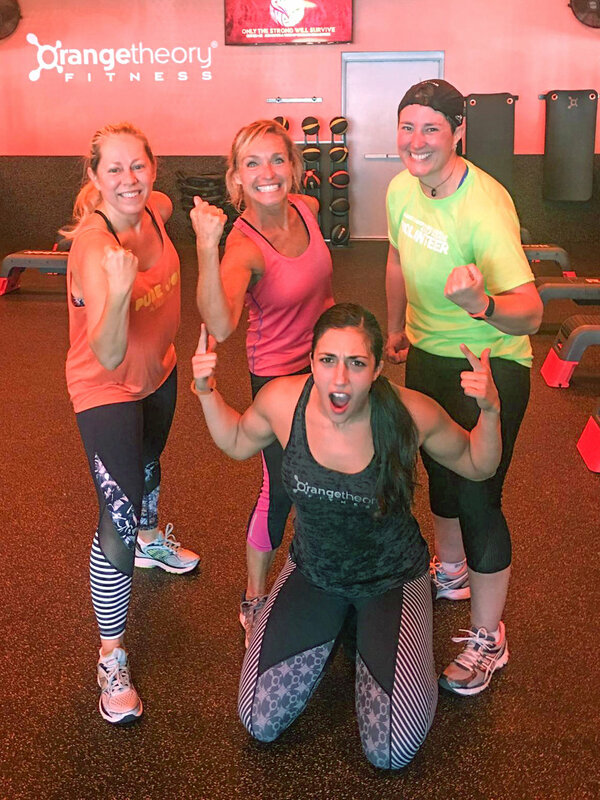 Training buddies at OrangeTheory Fitness. In 2017 she rode again, and this time added cardio and functional strength classes at the local Orangetheory Fitness to her preparations. She ended up cutting an hour off her 2016 time, and she plans to keep riding the Pan-Mass Challenge every year. “It keeps me connected to my dad, and it’s also my way of giving back. Plus it keeps me honest, I can’t just go out one day and do it, I have to train.” Jen is also looking for new challenges that will help her continue her fitness journey, including triathlons and other charity events like the PMC. But whatever she does, her improved fitness has given her options she never thought she would have. Dave Kraus (dbkraus@earthlink.net) of Schenectady is a longtime area cyclist, photographer, and writer who is looking forward to warm spring riding. Visit his website at KrausGrafik.com.